Kamakura is a city located in Kanagawa, Japan, about 50 kilometers south-south-west of Tokyo. 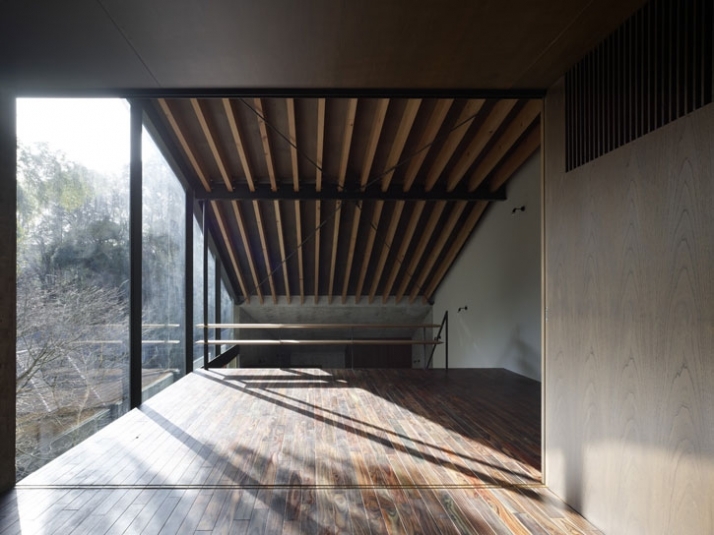 There, 35 year old architect Makoto Tanijiri of Suppose Design Office leaves us speechless by his design for one more time. 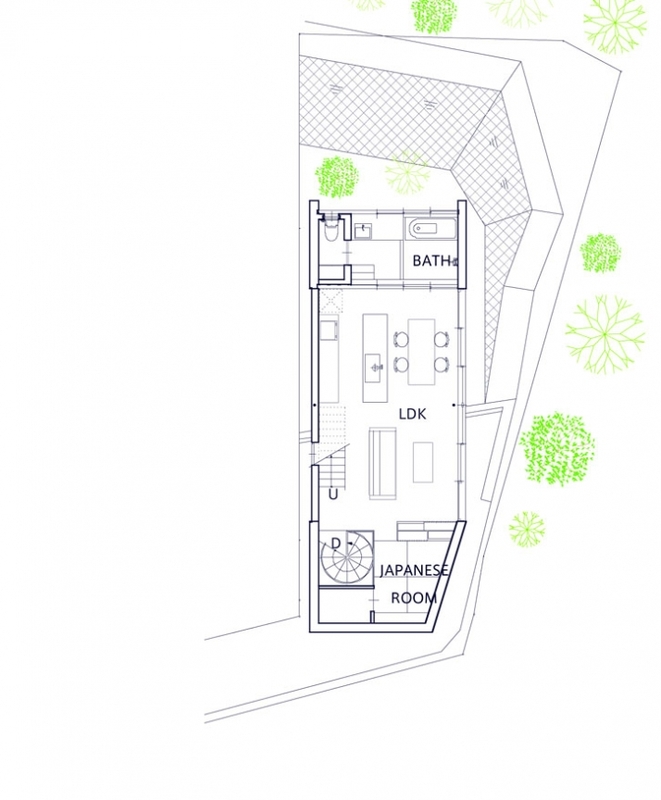 This Japanese house design is a fusion of the Japanese love of harmony and respect for the natural surrounding, otherwise known as organic architecture and the Western modification of a dematerialized architecture of steel, concrete and glass. 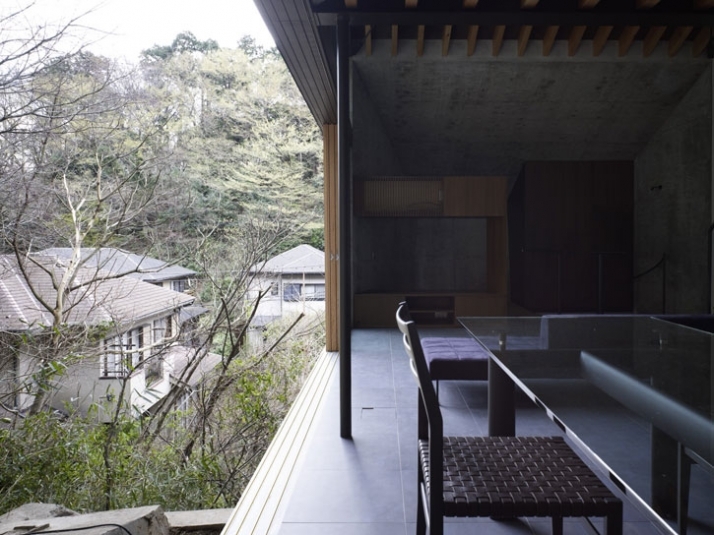 Kitakamakura house was constructed on an uneven site; while Tanijiri’s efficient and successful strong design concept has created beauty out of what people conveniently discredit _ an uneven plot. Tanijiri has managed to overcome the inevitable challenging structural issues. Two steel structural beams have been placed in the ground as the foundations between the two concrete shafts. The concrete shafts are installed in the ground at different levels due to the uneven ground, while they are somewhat at a distance from the retaining wall. 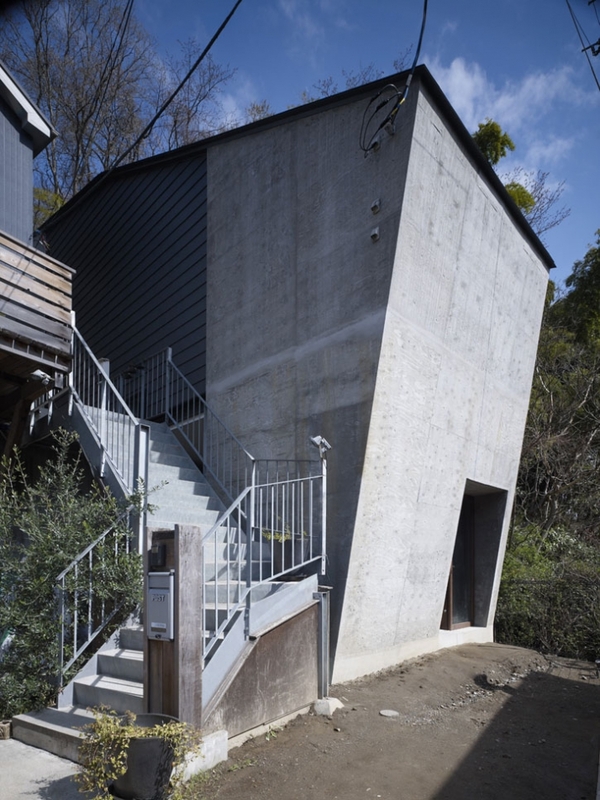 The sloped retaining wall does not touch the structure; instead it drains to the north terrace. 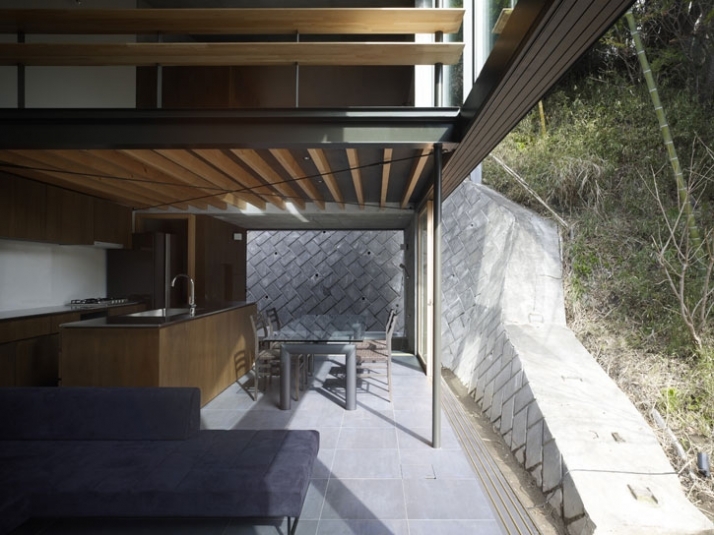 From an architectural point of view, the two house levels, the influence of the foundation footings and other facets cause uncertainties about the retaining wall. 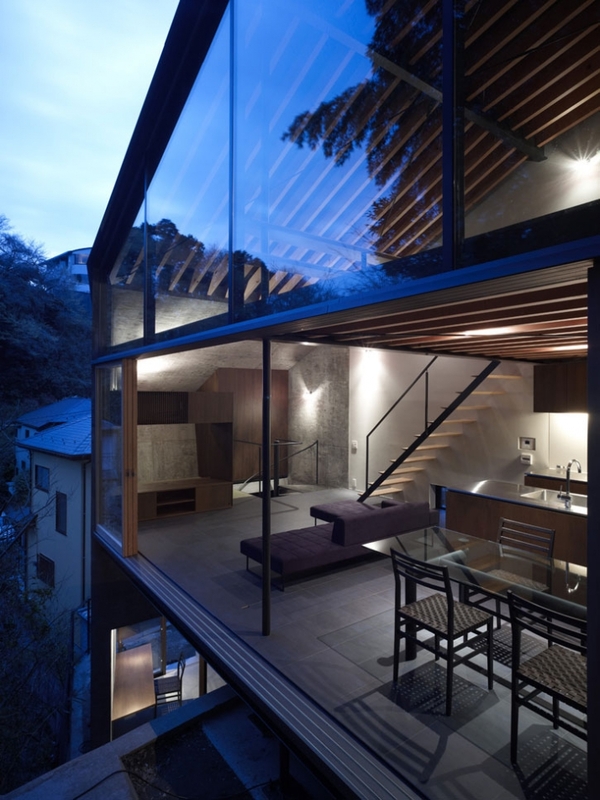 However, this construction ensures the safety of the occupants, the construction and the site at the same time. 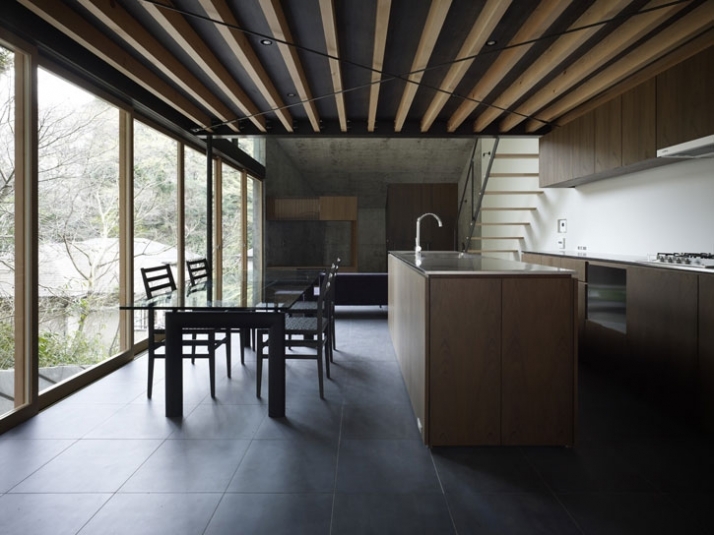 The design of this house has allowed for an efficient time saving construction process, as excavation work was kept to the minimum. 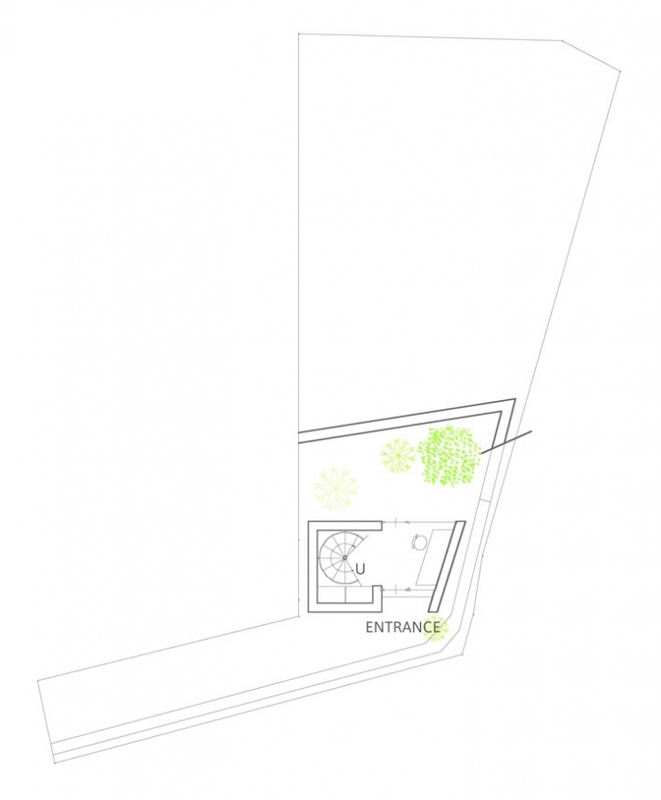 The uneven plot allows the void between the entrance of the house of the lower shaft and the next level of the inclined site to be used as a garden which is covered by the first floor. 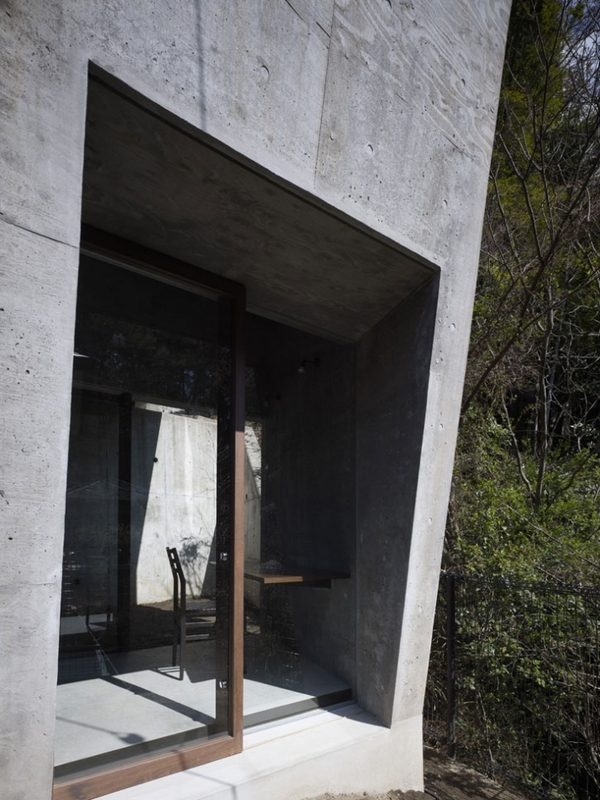 The co-existence of the concrete and the steel which covers the garden gives a feeling of a serene, bold space while the steel framework opts for an open space feeling where the family can enjoy this covered garden. 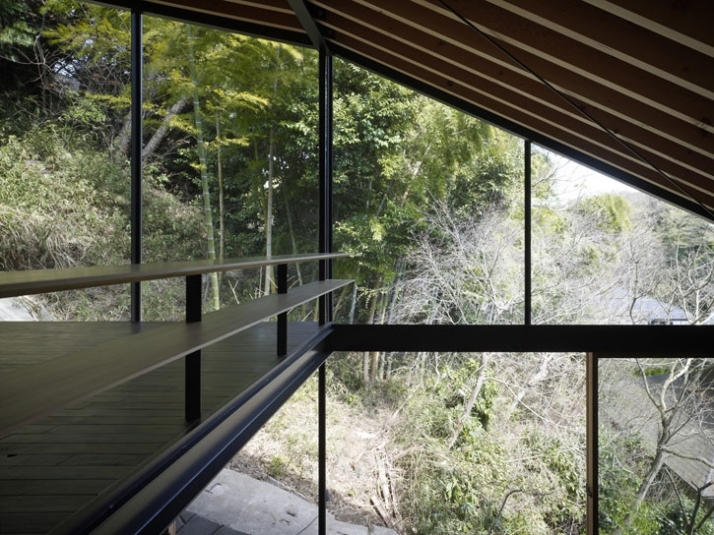 In the meantime, this covered garden although open on both sides provides the entrance area with ample of light. 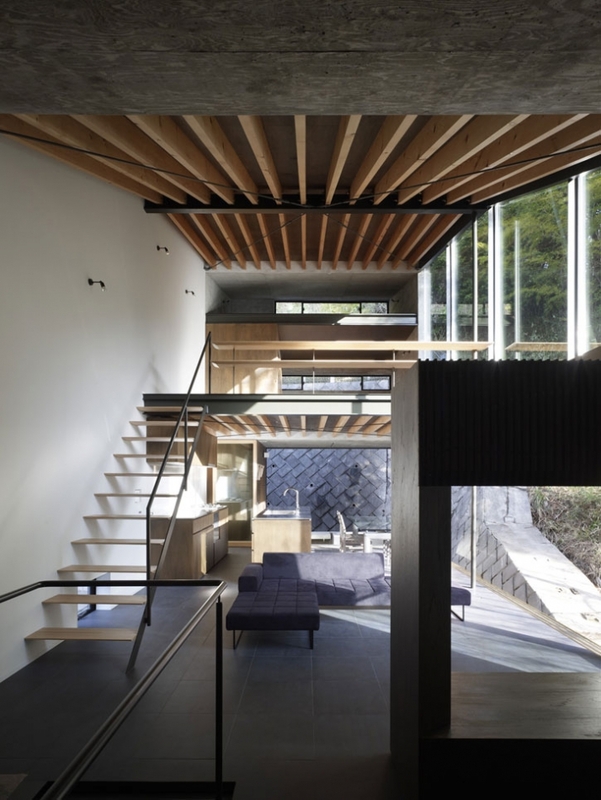 The spiral steel staircase leads to the first level where a Japanese room is located along with the living room, kitchen and dinning area and a bathroom. 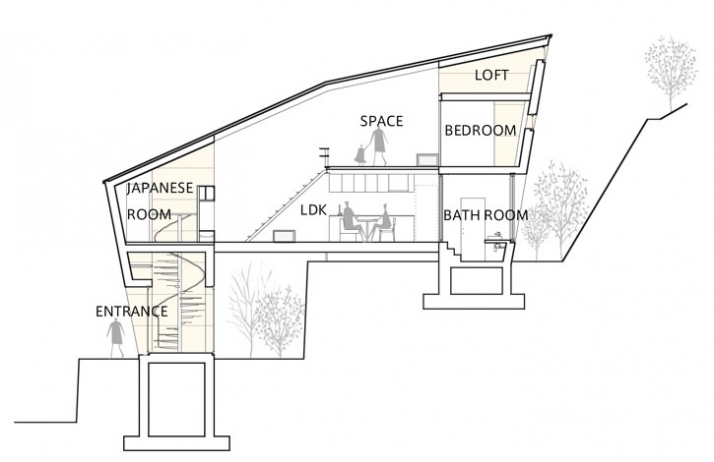 One would say that it sounds like a normal plan; but this isn’t any normal house plan as the bathroom is adjacent to the kitchen, with sliding glass doors that appear to have sand-blasted glass, and are meant to be open to show the design of the cement glossed bathroom including the bathtub, shower, and the faucet from a different perspective. 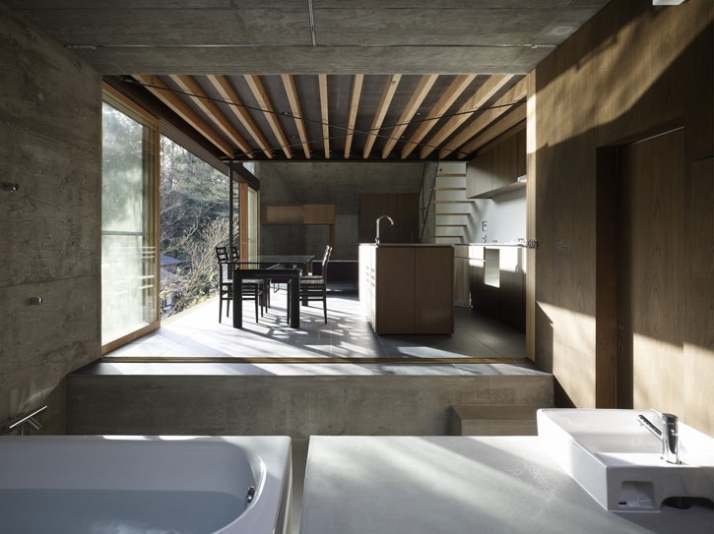 However, the toilet is enclosed in a separate area accessible through a door which is concealed with dark brown wood. 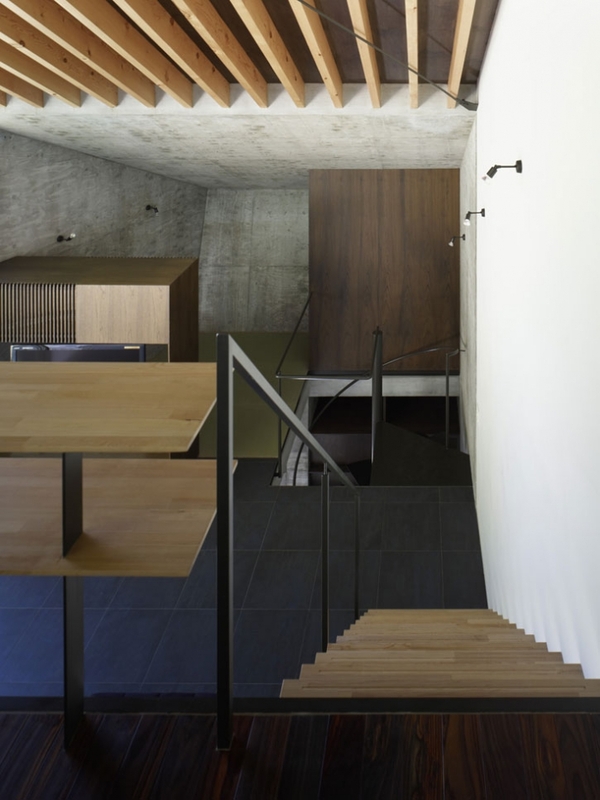 The first level connects to the second through a staircase with a steel handrail and thin wooden steps coming out of the wall. 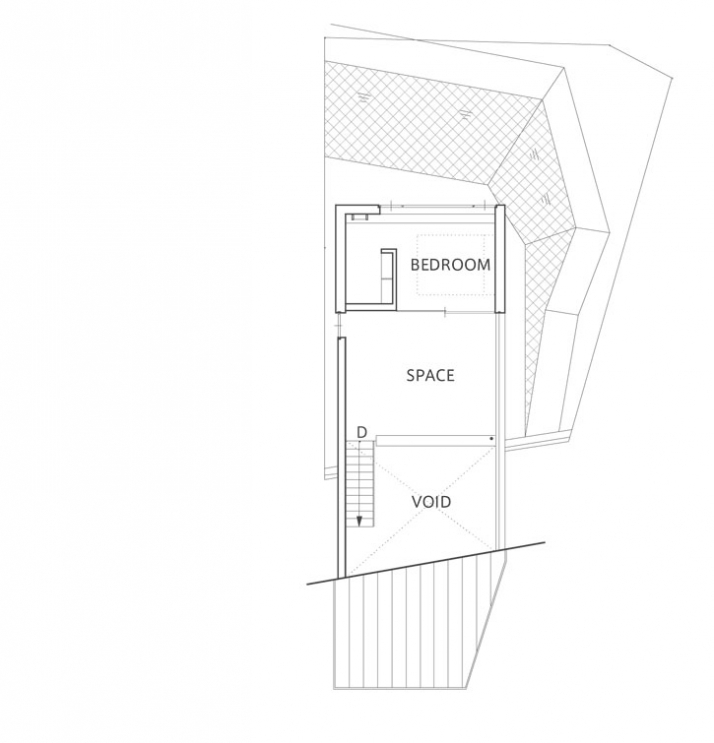 The second floor consists of an open space, a bedroom and a loft which is accessible through a ladder. Wooden beams run along the ceiling on all floors to bring a cozier homely atmosphere to the area rather than leaving plain steel. 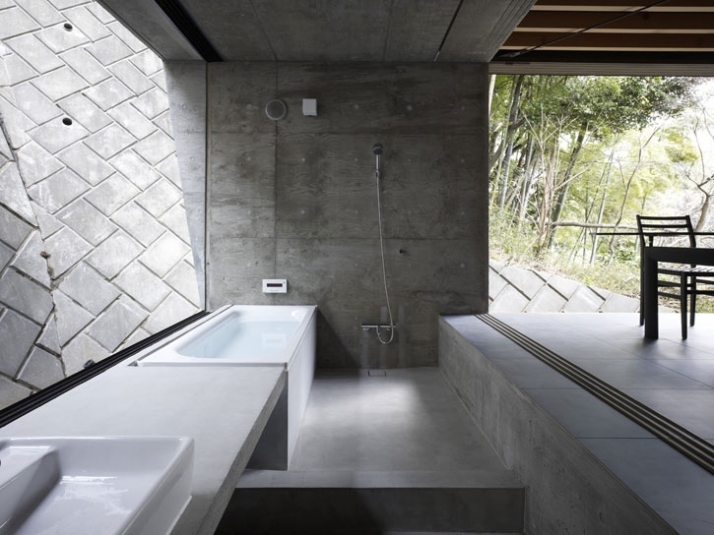 The specific design of the house and its form, although constructed from concrete, seems light and airy as if it floats on the uneven plot of land. 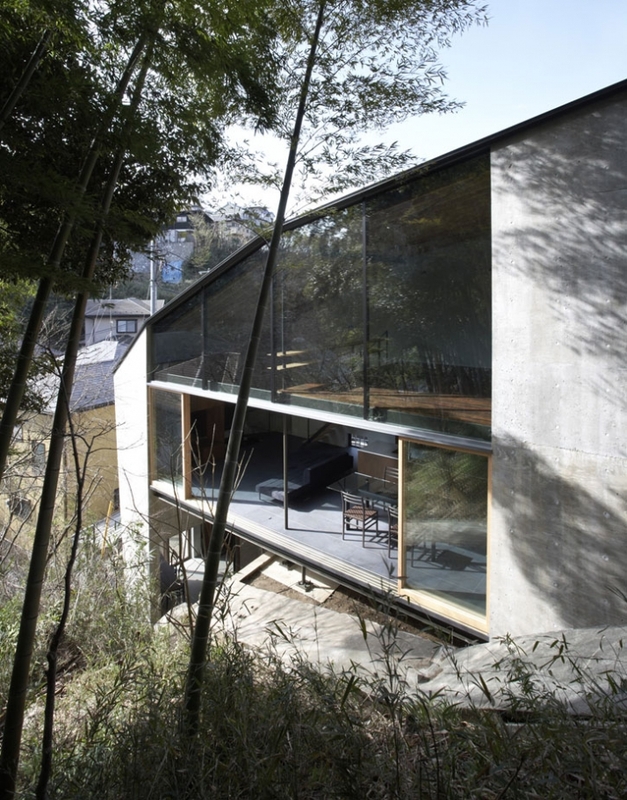 The two structural forms seem to tie in so well with the surrounding nature in this exquisite living environment. 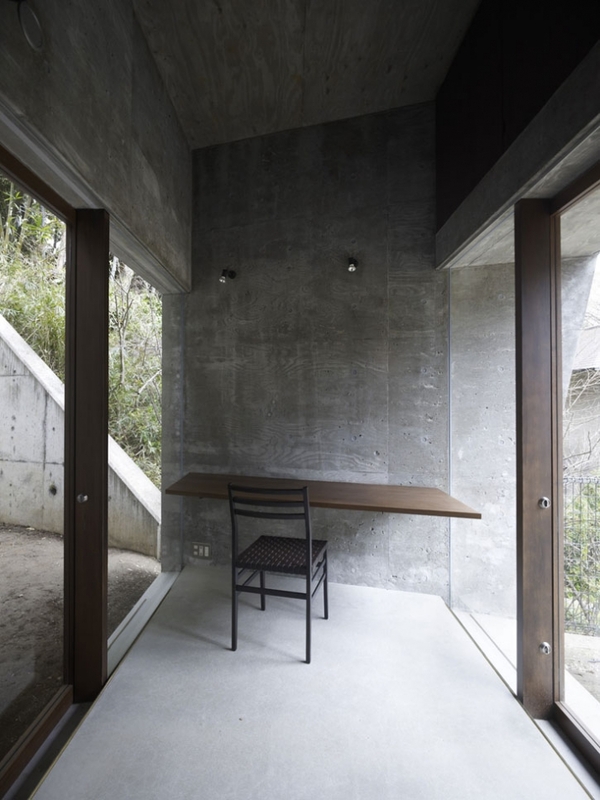 Tanijiri has integrated the building into the site as if it naturally grows out of the land with the least interference to the environment. 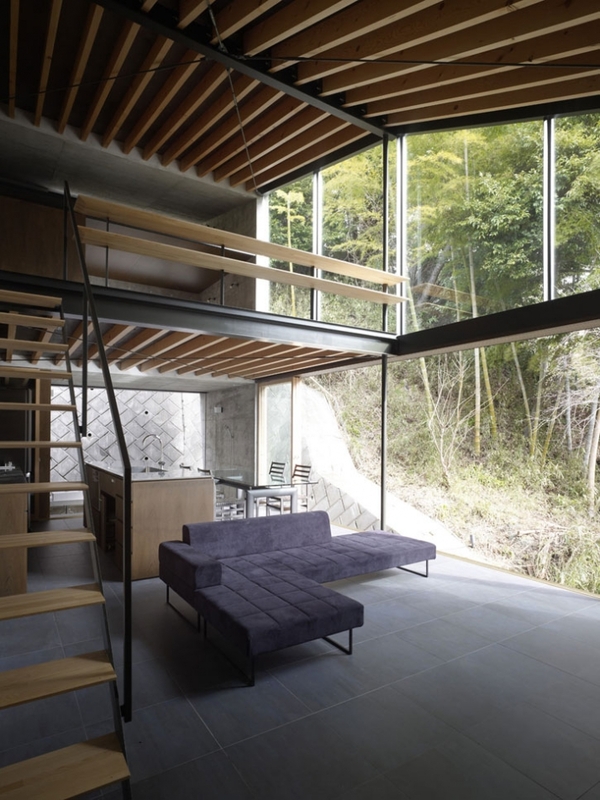 The well thought applications of the concrete, steel, timber and glass harmonically coexists in this modern Japanese dwelling. 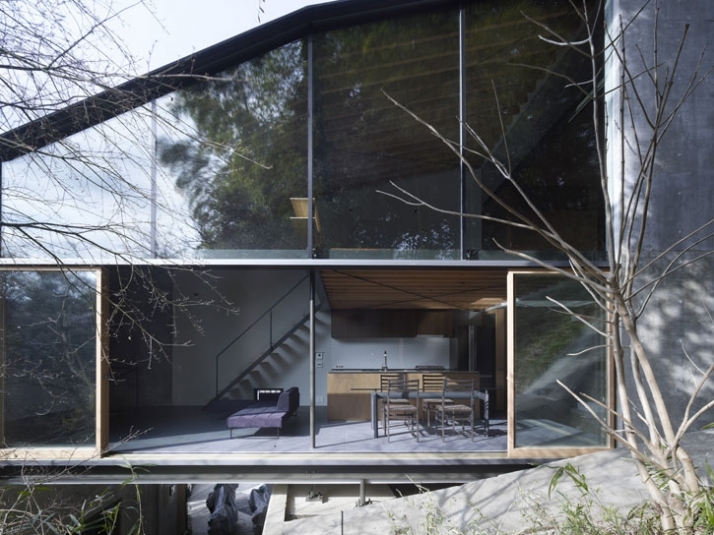 An elegant, unexpected house!